The handcrafted soap is made from the finest natural ingredients and pure oils to ensure quality and continuing freshness. 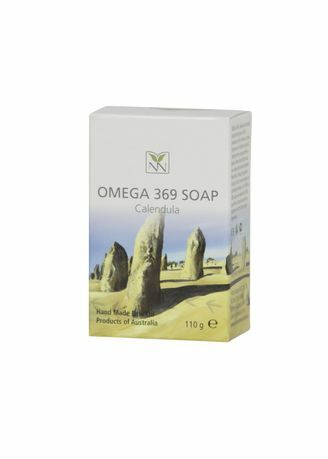 Omega 369 soap is made with 100% pure Calendula essential oil together with the finest natural ingredients like rice bran oil, emu oil and coconut oil which are all beneficial for skincare. Palm (Elaeis guineensis (Palm Oil), Rice Bran (Oryza sativa (Rice) Bran Oil), Coconut (Cocos nucifera (Coconut Oil), Purified Water (INCI Name: Aqua), Lye (NaOH) (Sodium Hydroxide), Emu oil, Calendula Petals (INCI Name: Calendula officinalis (Calendula) Petals), Rosemary Extract (INCI Name: Rosmarinus Officinalis (Rosemary) Leaf Extract.